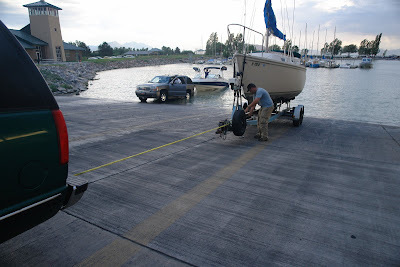 My goal tonight was to put the Unsinkable2, our Catalina 25 Sailboat, in to Great Salt Lake's South Shore Marina in preparation for tomorrow's sailing trip to Fremont Island, in the north end of the Great Salt Lake. I arrived at the marina at 5:30 pm, and quickly raised the mast with the help of Ray Bennett. I had launched a smaller sailboat at this marina 2 years ago when the water was higher, and at that time I had to drop my back wheels down into the salty water to launch the boat. This time I was better prepared. Or at least I thought I was. I mounted a spare tire holder with a rolling wheel hub on it. I also mounted a jack with a long (30") rise on it. The jack lifts the trailer off the vehicle hitch, and then lowers it all the way to the ground so the front of the trailer rests on the rolling spare tire. Well, in the past this has always worked for me. This time, it did not. When I backed down into Great Salt Lake, the trailer ran into some debris and stopped with the boat still completely out of the water. I assumed it was the bottom of the ramp, and we would not be able to trailer launch. We stood there on the ramp, puzzling over the predicament, as dozens of tourists snapped pictures and video from the shore. That's when the tourist arrived. I suppose he couldn't contain himself, standing there watching me in my idiocy on the shore, so he descended to share with us a very little-thought-through solution to the problem. So the tourist approaches and explains his solution. "Monsieur, pardon moi for interrupting, but I sink I hev zee solution to your problem. If you feed zee rope through a pipe about 20 meters long, zen you could push zee boat in zee water, and launch your ship." And he stood there, waiting for me to act on his battle plan. "What?!" I thought, "Could you back up the part in the plan where I push the rope through the 20 meter long pipe? I think I missed the part where you told me where the 20 meter long pipe came from..."
And then Pahoe arrived. Pahoe lives out at the marina and I am quite certain knows more about boats than anyone. He said he helped launch a Catalin 25 fixed keel (4' draft) last week, and that we would easily be able to launch our Catalina 25 swing keel. He had me pull the boat half way up the ramp, then add another 50' of rope to the 20' I already had. Then the scary part. He explained that the trailer needed more momentum, so I needed to release the brake and let the trailer roll back to the water as fast as it could go. I was scared to death. What if it tipped? What if I couldn't stop it and it pulled the suburban into the water? But something about a resident mariner inspires confidence, so I followed his advice. As I started to back the trailer down, I kept a light foot on the brake, and Pahoe started yelling, "No brakes! No brakes! Just let it roll!!" So I did. The trailer hit the water with an enormous splash. The Japanese tourists lined up along the ramp snapped picture after picture. The flashes were giving me a sunburn. No doubt they were all hoping to enter them in "Japan's Funniest Home Videos" for a chance to win 100,000 Yen. But Pahoe's experience won out. The trailer bounced unnervingly under the water, and eventually came to settle some 40' out in the water, obviously floating! Next, I swam out to the boat, and detached the cable connecting the trailer and bowhook. To my surprise, the trailer suddenly disappeared out of site. The trailer had been floating under the boat! So when I detached it, the trailer sank to the lake bottom, and was easily pulled out with the tow line. Covered in salty brine, I hosed the trailer off at the wash station and rinsed the salt off me too, then we went down to the dock to spend the evening sailing. The winds were light and the sunset fantastic that night. We flew the 150 genoa with a whisker pole, cruising along in the still water at about 5 miles an hour. See the picture of my brother in law Matt (at the mast) and me (behind the boom) as we sailed wing and wing along Great Salt Lake. My #5 and #6 kids were along for the trip, and enjoyed playing in the cabin and snacking on strawberries as we sailed. Grandpa Ray enjoys pampering the kids, and they really like it. See the picture of Grandpa Ray with the kids. We returned to the marina at about 11:30pm. Tired, but very relaxed after a nice night on the lake. The sunset was great, it almost looks fake. Sunsets on Great Salt Lake are always terrific. When the first explorers reached its eastern shore, they mistakenly assumed they had reached the Pacific Ocean, and turned to head east again. To the west of the lake is a great expanse of empty desert, which results in the most fantastic sunsets. Here is a picture of me and my wife in the setting sun that night. 2) Raise the trailer off the vehicle hitch using the jack. 4) Using the jack, lower the trailer until the front of the trailer is riding on the rolling spare tire, and the jack foot is well off the ground. 5) Pull the vehicle forward to take the pressure off the chocks, and remove them. 6) Back the trailer down into the water until it is far enough in to float the boat off. 7) When the boat is clear, pull the trailer out, and hitch it back up to the vehicle. Thanks for posting this great method! I'm wondering where you can get a "rolling spare tire mount"...just what we need. Our ramp is bumpy and we have to be back there guiding the trailer jack wheel that spins...too dangerous! Do you have a brand name or source? Thanks so much...great story! Here is a link to the rolling hub spare tire mounts. How do you retrieve your boat? You retrieve it in the same way, just with an empty trailer. The trailer weighs enough that gravity will pull it down into the lake. I'm willing to bet that you were pretty stressed during this process. I used to do it this way and hated it. This is how i do it now for a J/24 and any sailboat that's on a trailer. I took an old Rhodes 18 mast and cut it to 25feet. On one end of the mast I put a Reese ball mount with a 2' ball. On the other end an actual hitch that would accept a 2' ball. I attach the 2' ball hitch to my truck, and connect the 2' Reese ball mount to the trailer. The mast connects them together. Now i guide the boat down with no stress. And the biggest benefit, is that pulling the boat at the end of the season is done with the same setup just in reverse. The trailer is never disconnected from the truck, and the truck controls the whole process in and out. I got the idea from another j/24 sailor.